Technovit is one of the most sought after name in Methacrylate embedding medias in the world due to its diversity and availability of different kits and properties; there is a media for each of your applications. The systems developed by Heraeus Kulzer in collaboration with renowned scientists and institutes to embed tissue in plastic material for histological studies have proven themselves in practice for decades. They are successfully used for diagnostic and research purposes in medicine, veterinary medicine and botany. They are also successfully used in cutting technology for industrial applications and biomaterials. 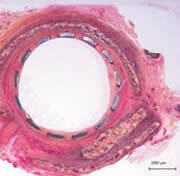 The systems fulfill important requirements such as embedding at low temperatures, thin and semi-thin section techniques and optimal division and abrasion properties. The sections can be easily stretched, and under the light microscope the stained preparations show excellent morphology. 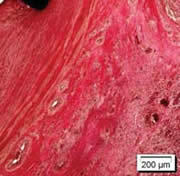 The scientific and economic conditions for histological studies of tissues are significantly improved with Heraeus Kulzer‘s histology technology. In contrast to all other embedding materials used in light microscopy in histological technology, uniform thin and semi-thin sections can be made after plastic has been embedded. In the process morphological details remain excellent. The mineralized and cellular structures can be better determined in undecalcified specimens embedded in plastic. 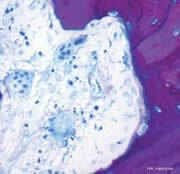 The mineral matrix and the cartilaginous and ligament tissues are very well maintained. The results of enzymatic immunohistochemical studies and in-situ hybridization show more sensitive and specific activity because all Technovit plastics harden at low temperatures and below freezing temperatures due to the special composition of the polymerization systems. Technovit 9100 is a plastic embedding medium system based on methyl methacrylate (MMA), which hardens at low temperature. 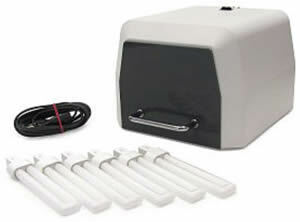 It is designed for the embedding of mineralized tissues with extensive possibilities of staining for light microscopy. 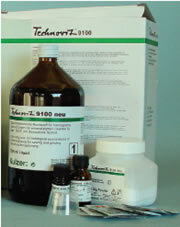 Technovit 9100 Polymerization takes place under the exclusion of oxygen with the help of a peroxide/amine catalyst. Additional components such as PMMA-powder and a regulator allows for a controlled polymerization at temperatures between -8 and -20°C, which guarantees for the dispersion of the heat generated during polymerization. The polymerization time is between 18 and 24 hours using a volume between 3 and 15 ml in the above temperature range. 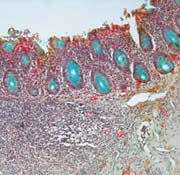 All the routine techniques such as preparation tissues, staining, immuno- and enzyme-histochemistry, in-situ hybridization techniques can be performed. Technovit Glycol Methacrylate embedding kits developed by Kulzer in Germany are the most convenient to use, and offers the best embedding results. Technovit 3040 yellow is a fast curing methyl methacrylate-based resin, whose chemical composition warrants a firm, durable bond between Technovit and the specimen. Technovit 3040 consists of two components – powder and liquid – allowing simple mixing, easy adherence to the specimen, and fast curing. For fixing the mount, a high viscous consistency is required (i.e. a mixing ratio of approximately 2-3 parts per volume powder: 1 part per volume liquid) has proven to be the most advantageous. Technovit 400 is a fast curing, cold polymerizing, three-component resin, which is based on a modified polyester, and it is available in the form of powder, syrup I, and syrup II. It is mixed at a ratio of 2:2:1 (powder:syrup I:syrup II). Syrup I and Syrup II are mixed together first and the powder is mixed in last. The color is white opaque. metal are a guarantee of gapless embedding of all metal samples. These properties are of particular importance when working with samples that require good edge definitions. After mixing, Technovit 4000 can be used for casting for approximately 4 minutes and takes approximately 8 minutes to cure. The unique EMS Technovit Polymerization Device (TPD) is a blue light curing device for all Technovit resins. The unit has built-in reflectors for homogenous curing of the blocks. The TPD fits up to 9 embedding molds and is generously sized. Due to the special demand for the thinnest possible sections, polymerized Technovit 7100 is most elastic and it is therefore recommended to fix the embedded specimen on a universal stable mount, to insure optimum clamping and cutting. To avoid a subsequent complicated removal of the specimens from the mount, an inexpensive disposable version was developed.